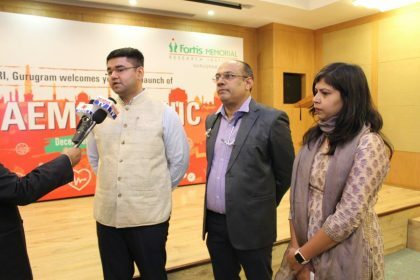 Gurugram: Fortis Memorial Research Institute, Gurugram launched its Anaemia Clinic in a large ceremony that saw the participation of community members in large numbers. The launch of this clinic, championed by Dr Rahul Bhargava, Director-Haematology & BMT, was attended by Mr Vinay Pratap Singh, Deputy Commissioner of Gurugram; Mr Shyam Sunder, Secretary-Red Cross; Dr Munish Prabhakar, President-IMA Haryana; Mr Vatsal Vashisht, Chairman-Mata Sheetla Management Board & Registrar-Gurugram University; Mr Parmanand Mongia, President-Senior Citizens Council of Haryana; Principals of seven government schools in FMRI’s vicinity including Chakkarpur, Wazirabad, Jacobpura and Kanhai, along with several senior teachers; representatives from the office of Haryana’s Chief Judicial Magistrate; the legal cell in the CMO office; several members of Senior Citizens forums; NGOs, Innerwheel Clubs, members of the Thalassemia society and Roti Bank in Faridabad. ” There is a large incidence of anaemia in India, especially in females. In a lead up to the launch, FMRI conducted a five-day camp in several government schools around FMRI where nearly 1500 girls were screened. The findings were presented at the launch, reiterating the prevalence of anaemia in India. It is to fight this disease menace that we have launched a special clinic for Anaemia dedicated to treating as well as creating awareness in order to empower the public in the fight against anaemia,” Dr Rahul Bhargava, Director-Haematology & Based on the large incidence of anaemia in India, the ceremony focussed on FMRI filling this need gap with the launch of this clinic. “Our basic aim is to make people aware about anaemia and its causes. Many times anaemia is a result of nutritional deficiencies, while many other times anaemia is the first symptom of blood or colon cancers. It is important that if someone is anaemic then the cause of anaemia is determined properly and then the disease is dealt with accordingly. This will be our main focus at the clinic,” Dr Bhargava added. 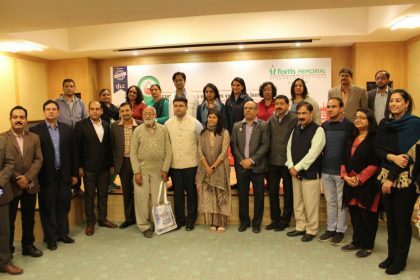 The event ended with a hearty lunch and all attendees were bid farewell with small plants to keep this association going and grow the fight against anaemia. Anaemia can be easily screened and detected by *HAEMOCHECK* Kits. It is very easy, quick, reliable and most economical.